300+ built-in stunning filters, overlays, transition effects, etc. What can video editing software do for you? With video editing programs, it's possible to create and share either funny or touching videos, which may carry precious memories of friends and family. In my opinion, a video editing software for beginners should offer practical tools to import, organize, edit and share videos quickly and easily. 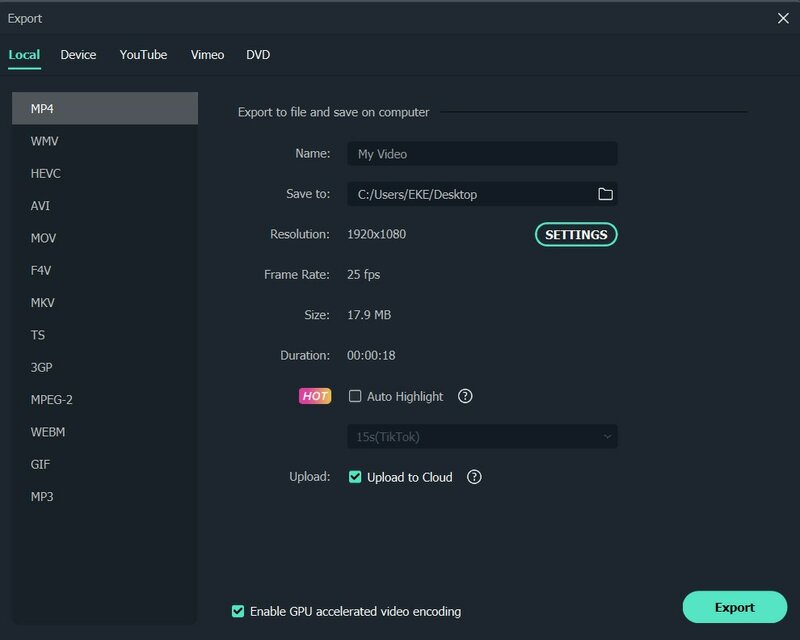 In this article, a good video editing software for novices will be introduced - Wondershare Filmora9 is well-known for its intuitive and easy to touch features, as well as in-depth tools you can also access if necessary, such as picture-in-picture, speed up/slow down, voice change, etc. Now download video editing maker free trial version below. Here are the key features of Wondershare Filmora9. Depending on the Mac OS X (Mountain Lion included), the Mac version is slightly different, but all features for beginning users are included. Although we think it's the best choice for all creators, no matter beginning users or intermediate video editing users, you will find it is a great helper. Supports all popular SD andHD videos, including MP4, AVI, MOV, M4V, MKV, WMV, MPEG, VOB, avchd (MTS/M2TS), TP/TRP/TS/M2T, and so on. Includes all common editing tools such as rotate, trim, crop, merge, etc. Add animated title with customizable font, color, text effect, etc. Fine tune video/photos with Contrast, Saturation, Brightness and Hue tools. Change video with 50+ preset visual effects. 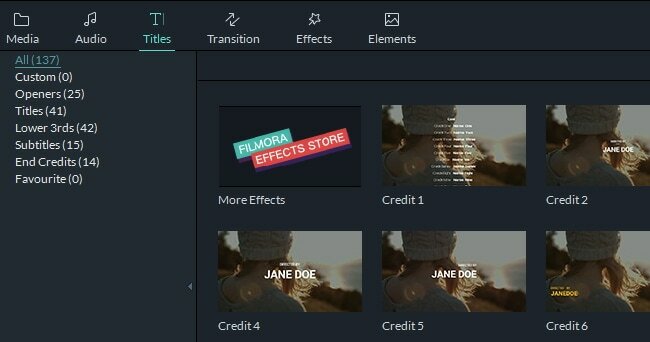 Add built-in Intro/Credit clips to create a great film. Record videos and voice-over with a webcam and microphone in one click. Although it's easy to use, we show you how to get started to learn about the workflow of this video editing maker as soon as possible. 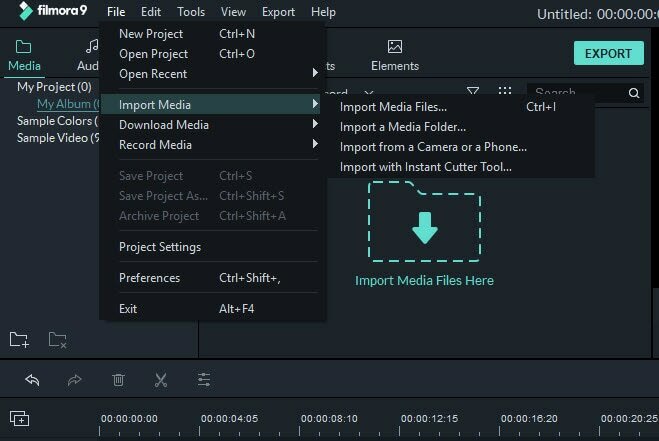 Find your favorite way to import video files: you can either click "Import" to add video files on your computer, or drag and drop files to the User's Album. All added files will be displayed in thumbnails in the album. Double click anyone to preview it in the right preview window. Now your video files are well organized with the program. You can easily find a video and make changes without affecting the original file. 1. Double click any video in the timeline to do basic video editing, including changing transform of the media (rotating, flipping, changing video scale and positons), applying stalization and compositing mode and add chroma key effect. You can also set contrast/saturation/brightness and other color grading features, apply motion effect or do audio editing. 2. On the Timeline, right click the media and select desired editing options such as chaning speed and duration, stabilization, color correction, and green screen as well. 3. To split video/audio footage, just place the palyhead to the target position and then click the Split icon in the toolbar ..
4. Go to the Title library and drag text preset to the video track to add captions and titles and customize them. This video editing software for newbie lets you make slideshows from photos to tell a complete story. Click "Transition" tab on the main screen and you will see 48 scene transition effects are provided. Drag your favorite one in the photo/video to apply. If you don't want to choose one by one, right click a transition, and select "Random to All" or "Apply to All" option. Sharing is what this video editing software values. After your editing is complete, click "Create" to choose the way you like to share your videos. The video can be created in all popular formats and for play on portable devices. You can also share your video creation on YouTube or directly burn videos to DVD to play on TV. This easy video editing software for beginners enhances your videos and adds final touches such as titles and special effects before sharing with the world. It's easier to use that the famous Windows Live Movie Maker for Windows and iMovie for Mac (Mac OS X 10.8 included), at the same time, it comes with important features that lets you edit videos like a pro. Choose it depending on your platform. Note: Keep in mind that Filmora9 is not a professional video editing program as powerful as Sony Vegas Pro for Windows or Final Cut Pro for Mac, which are famous for their omnipotence and precise controls on every detail. It's only a decent video editing software for beginners with easy to use features and for a reasonable price.